If you have hooded eyes you'll know just how frustrating it can be to follow along with a makeup tutorial only to find there's a cat flick and all your good plans turn to ruin. Well, maybe not quite that drastic, but it comes pretty close and can feel disheartening when you want the same look. 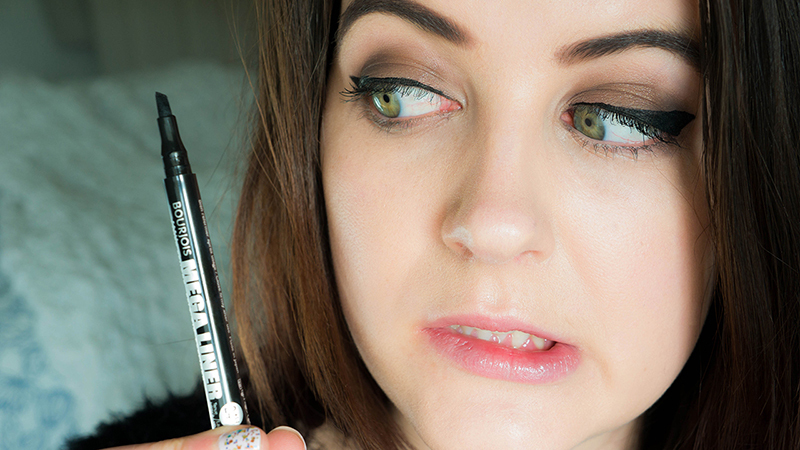 It wasn't until recently that I learnt how to make flicked liner work for me, and I have pretty bad hooded eyes. I've created a simple demo that you should definitely check out if you're having trouble getting it to work. Hopefully there will be no more wisp-thin liner flicks, smudges and sleepless nights. Just me? Thought so. I have extremely hooded eyes and have always made such a mess when trying to do a winger liner look. Your video has helped so much! Thank you! You have the most amazing eyes! Your eyes are absolutely beautiful! I have more hooded eyes as well! However I kind of self taught myself to do a wing before I ever started watching tutorials so I suppose that worked in my favor :) I know I've commented this before but your eyes are so so stunning! Thanks for sharing! I have slightly hooded eyes but never realised. I thought liner just wasn't my forte! I've written a January Favourites blogpost over on my blog. Check it out and let me know if you've tried any of the mentioned products. Also, keep an eye out for my February Flake-Away series. Hii :) I'm sorry to correct you on this, but you don't have hooded eyes, you actually have "standard" eyes because when you look straight foward we can see your lid area. Someone with hooded eyes, we can not see the lid area at all. Some exemples of celebrities with hooded eyes are Jennifer Lawrence, Taylor Swift and Blake Lively. I sent you a tweet as well just so you can see the response. :) Basically there are several severities of hooded eye. The dictionary definition is that it covers the eye more than usual. Comparing my eyelids to many other people and having been told by several makeup artists that I have hooded eyes. Maybe not to Jennifer Lawrence type of hooded, but they cover pretty much my entire lid when I'm resting my face in a natural position. I've looked into what my eye shape is and it doesn't match up with anything else, it's just a lighter severity of hooded eye, but still makes it a pain using eyeshadow and using eyeliner! I wanted to do my tutorial to better show people that might have the same problem as I do that they can still have a flick as, when I rest my face, my hood completely covers any area that I can use to extend a flick. Just wanted to clarify that I'm not just using hooded eyes as an excuse here, I genuinely have them, just not as bad as some of the celebrities you've listed. That liner looks so easy to use. I will not get tired of saying this, you have beautiful eyes!